Hi everyone! Today I have just one polish to show off that I didn't include in my last post of Jindie Nails' newer polishes. I seem to be owning a lot of white based "crelly" polishes lately, so I included a comparison of the ones I own from Jindie Nails at the end of this post. 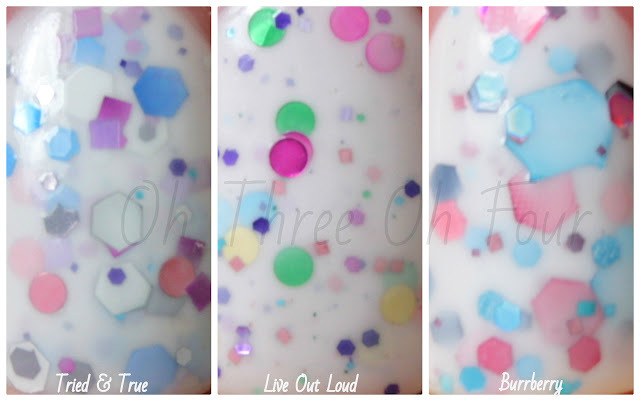 Tried & True has a white crelly base with gray, silver, magenta, blue, purple, lavender and pink glitter. All nails are 3 coats with a top coat of Seche Vite. Maybe you are like me and wondered how Tried & True compared to a few other white "crelly" based polish Jindie Nails makes. I decided to swatch them to show how they all do have their own difference and similarities. I used 3 coats of each polish with a top coat of Seche Vite. Find Jindie Nails on Etsy shop here, it is currently closed so follow her on Facebook to stay updated, and Mei Mei's Signatures here. Make sure to follow Jindie Nails on Facebook here and Instagram here for new colors and future restock dates. Tried & True was sent for review, all opinions are my own.